Our passionate team strives to curate and design high quality jewelries including earrings, necklace, rings, plugs, bracelets and body piercing. Can help you celebrate your personal style and all of the moments of your life. The drop earrings are made by high quality surgical steel, no lead pollution, no electroplate processing, no rusty and eco-friendly. It is hypoallergenic even sensitive ear can be used without worry. The stud earrings are our special own design, You will create your own unique ear piercing and release your personal charm. Multiple parts can be used: Cartilage, Helix, Conch, Lobe, etc. Pick up our fashion earrings at a great deal and let your ears sparkle with confidence! Various vintage style earrings are available. Worth collecting by Gothic, punk, biker, hip-hop, rock's lover. Bar Thickness: 18g(0.9mm), Bar Length: 10mm; Earring Length:17mm, 29mm, 30mm. Package:1 Pair(2pcs) drop earrings stud in an individual bag. - Excellent service we can offer to you: 90-day money back guarantee or exchange. 24 hour fast respond. - Any question, pls feel free to contact us for help. - Thank you for your visiting PiercingCool. Made of 316L Stainless Steel/ Cubic Zircon, Eco-Friendly, Lead & Nickle Free, Healthy & Hypo-allergenic, Durable and Easy to Clean. Vintage Skull/ Rose/ Sword/ Cross/ Staff/ Dragon/ Awl Dangle Designs for Choosing. Great for Hip-Hop, Gothic, Punk, Bicker, Rock's Fan to Show Personality. High Polished Comfortable to Wear. The Puch Back Design are Easy to Adjust and Keep Secure. Bar Thickness: 18g(0.9mm), Bar Length: 10mm; Earring Length:17mm-31mm. 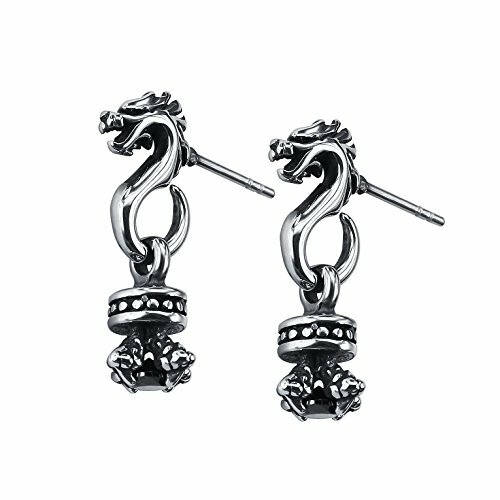 Package: 1 Pair(2 PCS) Unique Earring Studs. Guarantee: 90-Day Money Back or Exchange. If you have any questions about this product by PiercingCool, contact us by completing and submitting the form below. If you are looking for a specif part number, please include it with your message.